AT&T Stadium, the home site of the NFL’s Dallas Cowboys, was the host site of tonight’s PPV offering by Fox Sports and Al Haymon’s Premier Boxing Champions. This was the first ever boxing pay per view offering by Fox. The first fight of the pay per view was between Chris Arreola (37-5-1) and Jean Pierre Augustin (17-0-1) in the heavyweight division. Augustin was seven years younger than Arreola and has never suffered a defeat as a professional, but he has never faced someone on the level of Arreola before. Arreola started the fight off by coming forward behind his jab, but Augustin was able to land his jabs from the outside and touch Arreola often, but his power didn’t bother Arreola. Arreola had blood coming from his nose in the second round, but he didn’t appear to be bothered by it. Arreola connected with a stiff jab in the third round that staggered Augustin, and he was backing away and looked wobbly. Arreola followed it with a combination that sent Augustin to the mat and down for a count of nine, but the referee allowed it to continue. Arreola immediately jumped on the still wobbly Augustin and forced the referee to stop the bout. Arreola wins by TKO at 2:03 of the third round. The next bout of the night was between Luis Nery (28-0) and McJoe Arroyo (18-2) in the bantamweight division. Nery is a talented boxer and is making his US debut. Both boxers were southpaws and Nery was able to keep his distance and land outland his opponent early on. Nery scored a knockdown in the second round with a short left uppercut, but Arroyo was able to survive the round. Nery scored another knockdown in the third round after a quick combination that sent Arroyo to the mat. Arroyo had a small laceration by his nose as the third round came to an end. Nery did not look like he was concerned about the power of Arroyo at all and landed a three punch combination in the fourth round that sent Arroyo down again. Arroyo got back to his feet, but was sent to the mat again in the fourth round after another combination and he got to his feet as the round came to an end. His corner didn’t wait long to stop the fight in the fifth round, as Nery wins by TKO at 0:10 of the fifth round. A walkout bout between Lindolfo Delgado (8-0) and James Roach (5-1) in the super lightweight division was shown due to the quick stoppage of the prior two fights. Delgado looked to be in superior shape, and he has stopped all eight of his opponents that he faced so far. Delgado remains undefeated with a knockout at 2:59 of the first round. The next bout of the night was between David Benavidez (20-0) and J’Leon Love (24-2-1) in the Super Middleweight Division. Benavidez looked to be a lot taller than Love, and was able to avoid the jabs and body attacks of Love early on. Benavidez was able to land some heavy combinations on Love when his back was against the back of the ropes, and he had Love stumbling back to his corner at the end of the first. Benavidez continued to pound J’Leon Love when his back was against the ropes in the second round Benavidez landed two hard straight right hands to the chin of J’Leon Love, who covered up and offered nothing in return to stop the onslaught. The referee jumped in to stop the fight at 1:14 of the second round to give Benavidez the TKO victory. The main event of the evening was between Errol Spence Jr. (24-0) and Mikey Garcia (39-0) for the IBF Welterweight Title. The announced attendance for this fight was 47,525. Spence was active with his jab in the opening round and Garcia was showing good head movement. Spence’s straight left was landing in the first and second rounds, but Garcia kept it close in the second. Spence’s reach was a major factor in the second round as his jab kept Garcia at bay. Garcia was unable to solve the reach of Spence and took some heavy shots in the third and fourth rounds, as he landed some heavy power shots. Garcia came out strong in the beginning of the fifth round, but Spence quickly turned the momentum back in his favor with a crisp jab followed by power left hands. By the sixth round Spence looked like he was running away with the fight and was walking Garcia down and in total control. 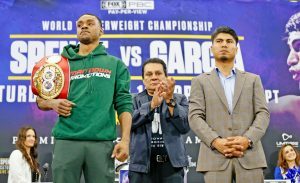 Spence continued to touch Garcia at will in the seventh and eight rounds and Garcia had no answer for the offense of Spence. Garcia was able to land a few counter shots, but they had little to no effect on Spence. Spence looked like he was close to stopping the fight in the ninth round as he pounded Garcia from corner to corner, but Garcia was able to stay on his feet and grit his way through the round. 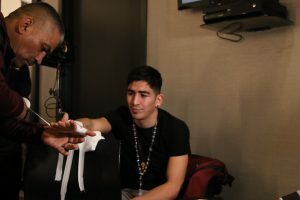 Garcia was warned by his brother/trainer Robert Garcia that he was going to stop the fight before the start of the tenth round if he didn’t’ show him a little more than what he saw in the ninth round. Garcia was able to land some punches, but still got pummeled by Spence through most of the round and didn’t really threaten his opponent. Garcia needed a knockout in the final two rounds in order to win the bout, but in the eleventh round it appeared it was Spence who was going for the stoppage as he brutalized both the body and head of Garcia. Even though Spence was comfortably ahead in the final round, his corner told him to go for the stoppage and he did, but Garcia was able to survive the fight. Errol Spence wins by a wide decision with scores of 120-107, 120-108, and 120-108. Afterwards, Spence called out Manny Pacquiao for a fight and Pacquiao appeared to willingly accept it. On Saturday night Al Haymon’s Premier Boxing Champions along with Fox Sports will put on a Pay Per View offering live from Arlington, Texas. This card will take place at the home of the Dallas Cowboys at AT&T Stadium. 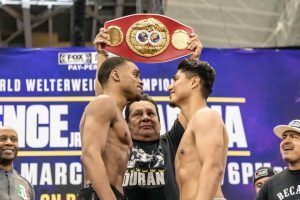 The main event of the night will be a bout between two undefeated fighters, Mikey Garcia and Errol Spence Jr. for Spence’s IBF Welterweight title. Garcia looks to make history as he jumps up two weight classes to take on Spence while Spence looks to cement his place as the welterweight division’s top fighter. The co-main event of the night will be between David Benavidez and J’Leon Love in the super middleweight division. The winner of this bout will put him closer to a future title shot. Seventeen fights are currently scheduled on the card! The undercard will feature boxers such as Luis Nery, McJoe Arroyo, Chris Arreola, Charles Martin, and Fernando Garcia. David Benavidez is known as the youngest boxer to ever hold a Super Middleweight Championship, but he hasn’t been super active in the ring since he had a positive test for Cocaine in September of 2018 and had to serve a four month suspension. On Saturday he’ll be facing one of the toughest tests of his career in veteran J’Leon Love. Benavidez will have an inch and a half height advantage as well as an inch and a half reach advantage over Love. He is also nine years younger than Love, though Love is still in his athletic prime. Benavidez has been fairly active, but only fought once in 2018 due to his suspension and fought three times in 2017. Love fought twice in 2018 but only fought once in 2017. Benavidez didn’t fight often as an amateur, but has been boxing as a professional since he was a teenager. Love does have an edge in amateur experience as he competed both in the Olympic trials and the Golden Gloves tournament as an amateur. Benavidez has the edge in power, as he has stopped seventeen of his opponents while Love has only stopped thirteen. In fact, Benavidez has been able to stop eight of his past ten opponents. Benavidez has defeated the likes of Ronald Gavril, Rogelio Medina, Sherali Mamajonov, Denis Douglin, Francy Ntetu, and Philip Jackson Benson. Love has defeated the likes of Marcus Upshaw, Scott Sigmon, Marco Antonio Periban, Vladine Biosse, Lajuan Simon, and Derrick Findley. His losses were to Peter Quillin and Rogelio Medina. Love is a veteran, but he lacks that big named win on his resume to consider him to be a serious threat to Benavidez. The action may be slow in the beginning as Benavidez attempts to figure out Love’s style, but this writer expects him to dominate the middle to later rounds. Let’s get the obvious out of the way. Mikey Garcia is bumping up to weight classes to face Errol Spence and will have a size disadvantage. He’ll also be giving up three inches in height and about four inches in reach to Spence. Garcia has fought as high as the junior welterweight limit of 140 pounds, but fought his last fight at 135 pounds. Spence is also two years younger than Garcia, but both fighters are still in their athletic prime. Both boxers are known for their power and their ability to stop their opponents. Spence has stopped twenty one of his opponents while Garcia has stopped thirty. However, Spence is currently riding an eleven fight stoppage streak while Garcia has only stopped two of his past five opponents. The power has not follow him as he has jumped weight classes. Spence has never been defeated and has defeated an impressive list of fighters. He has beaten the likes of Carlos Ocampo, Lamont Petereson, Kell Brook, Leonard Bundu, Chris Algieri, Chris Van Herrden, Phil Lo Greco, Samuel Vargas, and Ronald Cruz. He also had a successful amateur career and was a former US National Champion as well as a Olympic Participant for the United States in the 2012 Summer Olympics. Garcia has defeated the likes of Robert Easter Jr., Sergey Lipinets, Adrien Broner, Dejan Zlaticanin, Juan Carlos Burgos, Roman Martinez, Juan Manuel Lopez, and Orlando Salido. As an amateur Garcia was a Police Athletic League Silver Medalist as well as a Bronze Medalist in the National Golden Gloves Championship. Garcia is an excellent fighter, but he’s facing a man who’s bigger, longer, and more powerful. The size advantage will likely be too much for Garcia to overcome, but he should still have his moments in this fight. This writer expects Spence to win a closer than expected decision victory. The Barclays Center in Brooklyn, New York was the host site of tonight’s Premier Boxing Champions Card on Fox with three scheduled fights. The untelevised undercard included a shocking knockout of Marsellos Wilder, the brother of Heavyweight Champion Deontay Wilder, to William Deets. The first bout of the night was between Claudio Marrero (23-2) and Tugstsogt Nyambayar (10-0) in the featherweight division. This bout was a WBC Featherweight Title eliminator. Nyambayar, a fighter from Mongolia, had a small but boisterous contingent in the crowd. Nyambayar goes by the nickname of King Tug. King Tug had a southpaw across from him, but he was able to land some good crosses to the body and quick combinations early. Marrero showed a good jab in the second round and connected with some straight lefts in the third, but King Tug landed the cleaner and harder punches, and had Marrero wobbly in the thirdrom a good straight right hand and he followed that with some heavy combinations in the fourth. King Tug’s accuracy was just better in the fifth and both punches landed some good shots in the sixth round, and Tug looked like a mouse was forming under his left eye. Marrero had a strong seventh and eight rounds as Tug wasn’t as aggressive as in previous rounds and Marrero was landing his right hooks. The ninth round could have been scored either way, and the tenth was also close but Marrero lost a point for landing a punch during the break. The eleventh round featured combinations from both fighters who let their hands go, but King Tug looked like he landed the better shots. Marrero came out very aggressively in the final round and may have landed some punches in the back of the head before the referee quickly broke them up. Marrero was fighting as if he knew he needed a knockout to win but that knockout never came. The final scores were 114-113, 115-112, and 116-111 for Tugstogt Nyambayar. The co-main event of the night was between Adam Kownacki (18-0) and Gerald Washington (19-2-1) in the heavyweight division. Kownacki had a softer appearance in muscle tone when compares to Washington, but he didn’t appear to be intimated by Washington’s physique as he came at him right away and landed a good right hand followed by a short left hook. Washington was able to land some shots of his own in return, but Kownacki kept up the pressure and a good pace and was beating up Washington in the opening round. Kownacki did have a cut near his eye by the end of the round. Washington came out aggressively at the start of the second round and landed some good punches, but Kownacki took them well and landed a body shot that quickly slowed the momentum of Washington. A straight right hand from Kownacki knocked Washington down who struggled to get up before the count of ten. The referee allowed him to continue, but two more hard shots from Kownacki forced the referee to step in and stop the fight. Adam Kownacki wins with an impressive knockout at 1:09 of the second round. The main event of the night was between Keith Thurman (28-0) and Josesito Lopez (36-7) for the WBA World Welterweight Title. Thurman was sharp with his counters early on as Lopez pressed the pace and was warned for a low blow early on. Thurman was able to show good in and out movement in the second round and was able to knock Lopez down with a short left hook. Lopez got up by the count of eight and was able to survive the round. Thurman’s accuracy and movement won him most of the middle rounds, but Lopez remained game and took some of Thurman’s best shots well. Lopez had Thurman’s back against the ropes during the sixth round and was sneaking some punches in, but he really turned the tide in the seventh round. In the seventh Lopez looked close to knocking Thurman down early in from hard left hooks and was battering him from corner to corner. Thurman was fighting to survive the seventh but looked recovered and well by the eight round. Thurman landed some heavy shots in the eighth round, but Lopez took those shots well and stayed moving forward applying pressure. Both boxers landed heavy blows in the ninth round and showed a tremendous chin and a willingness to exchange punches. Thurman stuck to trying to out box Lopez in the tenth and eleventh round on the ever charging Lopez, and he likely won those rounds despite Lopez being able to sneak in some good shots. The final scores were 113-113, 115-111, and 117-109 for Keith Thurman. Keith Thurman will make his much awaited return to the ring this weekend, as part of PBC on Fox, following extensive injuries to his hand and elbow. 22 months on from a split decision victory over Danny Garcia and Thurman will defend his WBA ‘Super’ Welterweight Championship against Josesito Lopez (36-7). The welterweight scene, of course, has changed vastly since Thurman’s last bout with the emergence of Errol Spence Jr, Manny Pacquiao’s Indian summer coming to fruition and, indeed, Terence Crawford moving up in weight class. All three pose very real threats to Thurman’s WBA supremacy but One Time will be looking to brush off the cobwebs and establish himself at the top of the division. At the Barclays Center, this Saturday, it will be a solid indication of how Thurman has responded to injury rehabilitation and what, if any, impact it has had on him as a fighter. A former unified champion, of course, the 31 year old has been in and around the world level for just over six years. It’s been a while – not just in terms of time – since we’ve seen a vintage Thurman performance, however, but he still shunted himself towards pound-for-pound contention. Openly targeting a fight with Manny Pacquiao, that fight looks likely to happen given the Filipino’s secondary title status but the prospect of the contest remains enticing. Against Josesito, on paper, Thurman should have a relatively easy body of work – you could expect no less after such a lengthy lay-off. Josesito Lopez isn’t just a name on paper, however, with The Riverside Rocky having been in the ring with Saul Alvarez, Marcos Maidana and Andre Berto – stopped on all three occasions, mind. With three fights since April 2015, the same number as Thurman, the Californian welterweight hasn’t exactly been the most active over recent years. Seen, throughout time, as a decent yardstick for bigger names looking to get a good performance under their belt, Lopez comes out of the blocks fast continuously before fading around the halfway mark. 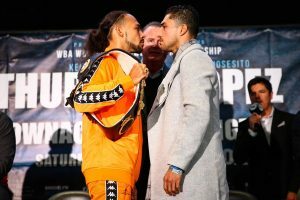 Seven years on since his latest victory of note – a surprise win over Victor Ortiz – it has to be said that Lopez is likely to pose little in way of threat to Thurman’s 28-fight unbeaten record. Thurman is expected to come through the contest and look good in doing so but any slip-up from the Clearwater-boxer could be exposed on a large scale by his opponent – don’t put your money on an upset victory, though. The big bruisers on the undercard come by way of San Jose, California and Lomza, Poland as Gerald Washington and Adam Kownacki look to settle a score with their contest scheduled for 10 rounds. Polish born, Brooklyn resident, Kownacki will enter the ring as a betting favourite and boasting a record of 18 and 0 whilst Washington, a marginal underdog, looks to put himself in the frame for another world title shot. Having challenged for Deontay Wilder’s WBC Championship in February 2017, Washington’s return saw him retire from a contest with Jarrell Miller before, in his only contest of last year, the 36 year old laboured to a victory over John Wesley Nofire. I use the word ‘laboured’ because whilst the win was routine and, to be frank, easy, Washington didn’t pack the explosive punch power of past performances. 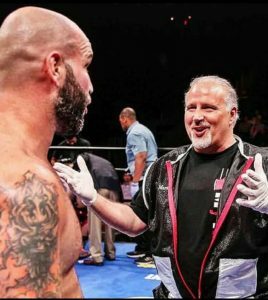 Kownacki, on the other hand, has finished fights with Joshua Tufte, Artur Szpilka and Iago Kiladze in comprehensive fashion – all since 2017 – whilst his last contest against Charles Martin saw the two fighters push each-other in a 50/50 contest. Famed for his tendency to keep his hands down low and march forward, Kownacki takes a fair few punches on his way to victory but, thus far, victory has always been his. Definitively a step up in class for Kownacki – ranked 5th the IBF and 8th with the WBC – he’ll need to be far more defensively orientated if he is to come through unscathed. Washington, despite his age, has the instinct not to allow such a lapse in technicality go untested. One thing you can guarantee from this fight is an utter slugfest. Make no mistake though, all eyes are on the returning welterweight with Keith Thurman, the man that’s been left behind, seeking to cast aside any doubts about his recovery. Premier Boxing Champions made their contract debut with the Fox Network tonight live from the Barclays Center in Brooklyn, New York. 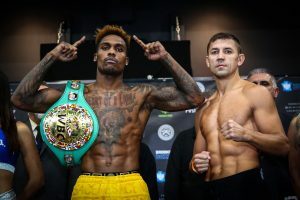 The main event featured a last minute replacement as former title contender Willie Monroe Jr. was flagged for possible performance enhancers and Matt Korobov agreed to take his place. Many felt Korobov was a tougher matchup for Jermall Charlo than Monroe, and the fight appeared to confirm that thought. The opening bout of the night was between Dominic Breazeale (20-1) and Carlos Negron (20-2) in the heavyweight division. Breazeale looked a bit sluggish early on and may have given up some of the earlier rounds based on Negron’s activity alone. Negron landed some questionable punches at the end of the third round that appeared to land after the bell had rung. Breazeale’s accuracy began to improve in the middle rounds and he made it clear that he was the more powerful puncher of the two. A thunderous right hand by Breazeale ended the fight in the ninth round as Negron crashed to the ring and had his head hanging over the middle rope. Dominic Breazeale could be seen challenging Deontay Wilder, who sat ringside, after the stoppage. Breazeale won by a TKO at 1:37 of the ninth round. The next bout of the night was between Tony Harrison (27-2) and Jermell Charlo (31-0) for Charlo’s WBC Super Welterweight Title. Charlo appeared to be more tentative than usual, and wasn’t throwing combinations like he normally does. He was the more aggressive fighter and pressed the pace, but a lot of his punches were missing and he was open to some of Harrison’s counters. Charlo did land the harder punches throughout the night, and he appeared to have hurt Harrison on more than one occasion. But Harrison’s jab was active and accurate and he kept most of the rounds close and hard to score. Harrison did appear to nearly knock Charlo down in the fifth round with a right hand, but Charlo was able to answer him later with a scorching right hand that had Harrison stunned. Charlo’s best round of the night may have been the last two rounds, as he landed a beautiful uppercut in the eleventh and appeared to have hurt Harrison with a left hook in the twelfth, but the judges didn’t feel it was enough for Charlo to win the bout. In a bit of an upset, Tony Harrison won the scorecards with scores of 115-113, 115-113, and 116-112. The main event of the evening was between Jermall Charlo (27-0) and Matt Korobov (28-1) for the WBC Interim Middleweight Title. Korobov was a cagey veteran who’s lone blemish on his record was a shocking stoppage upset to Andy Lee, in a fight that he was winning on the scorecards at the time. Despite not having a meaningful fight in over eighteen months, he showed no signs of ring rust early on and had Charlo bothered with accurate counters while showing good upper body movement to avoid Charlo’s power shots. Charlo’s noticeable reach advantage worked to his favor in the middle rounds as Charlo became more active with his jab and kept it in the face of Korobov. But the later third of the fight Korobov’s right eye was nearly swollen shut. The first four rounds could have been arguably scores for Korobov, but Charlo had a strong fifth round that was punctuated with a short right hand and he continued that momentum into the sixth and seventh rounds. The ninth round featured both fighters landing hard combinations, but Korobov was starting to tire and Charlo was still able to throw hard shots. Charlo had Korobov covering up in the tenth round and the eleventh round was very competitive. Charlo appeared to have a slight lead going into the final round, but his best round of the night was the last round as he had Korobov hurt with several hard shots and had the referee looking at Korobov closely with an eye towards a possible stoppage. There was no controversy with this decision, though it was a close and entertaining fight. Charlo retained his title with scores of 116-112, 119-108, and 116-112. Loud, brash, cocky and arrogant are words that can be used to describe the Charlo twins Jermall (27-0, 21 KOs) and Jermell (31-0, 15 KOs). Explosive, confident, impressive and revered can be used as well. Whichever word you choose will lead you to the same conclusion. They are must watch television. Both will be returning to the big screen this Saturday night as they put their undefeated records on the line at the Barclay Center in Brooklyn New York live on the first PBC on Fox card. Jermall, who is the number one contender for the WBC Middleweight title and also possesses the interim title was originally scheduled to take on two time title challenger Willie Monroe Jr (23-3, 6 KOs). However with less than one week remaining until the night of the fight Monroe was busted by VADA for an adverse finding in his urine sample. He was subsequently removed from the card and replaced with Matt Korobov (28-1, 14 KOs). Although this is considered a short notice bout, it isn’t your typical one. Korobov was already in training for a matchup against Juan De Angel on this very undercard. The bout was scheduled to take place at 168 pounds but he had no trouble in trimming down to the Middleweight limit of 160 pounds as he weighed in at 159.8 this afternoon. On paper Korobov will provide Jermall with his toughest opponent to date. Matt was a decorated amateur having defeated the likes of Sergiy Derevyanchenko and Oleksandr Usyk to amass a record of 300-12. In the pros he has been impressive as well. He handed current IBF Super Middleweight champion Jose Uzcategui his first defeat in his biggest win to date. Korobov’s lone defeat came in 2014 at the hands of now retired fighter Andy Lee. Matt was ahead on the scorecards and in complete control of the fight before a right hand by Lee followed by a flurry of punches put a halt to the contest. He has gone on to win four bouts in a row since then. In short this will in many ways present a much tougher task for Jermall then his originally scheduled opponent. The interim champion has looked great thus far but many would venture to say that he is still unproven and not quite ready for the elite of the Middleweight division. A win over Korobov won’t silence his doubters but a dominant performance just might. Speaking of dominance, that is the exact word that can be used when describing Jermell’s title run at Jr Middleweight. The younger by one minute Charlo has knocked out four of his past five opponents. He will be looking to add another highlight reel knockout to his name when he takes on Tony Harrison (27-2, 21 KOs) in the co main event. Jermell has his eyes set on a future showdown with unified champion Jarrett Hurd. It would be a matchup of arguably the two best Jr Middleweights. As much as Jermell wants that fight to happen he would be foolish to overlook Tony Harrison. Boxing ability, punching power, ring IQ. Tony has it all. His biggest problem has always seemed to be his gas tank. He was stopped by both Jarrett Hurd and Willie Nelson in the ninth round of both contest while leading on the scorecards. Tony’s stamina failed him on both occasions. Coming in to this contest however, Tony has told anyone that will listen that he has solved his issues. If he truly has found a way to keep a consistent pace for a full 12 rounds then he will pose plenty of issues for the champion. Many have dismissed both Matt Korobov and Tony Harrison as easy fights for the Charlo’s. Both bouts will be anything but that. If the twins hope to continue their dominant run they will both have to overcome two great challenges ahead of them come Saturday night. This Saturday night, the Barclay’s Center in Brooklyn, New York, will host the final major fight card of 2018. The fights begin airing live at 8 PM eastern standard time, on Fox, which has recently made a deal with Al Haymon’s Premiere Boxing Champions, the promoter behind the card. There will essentially be two main events, each featuring one of the Charlo twins, 27-0 middleweight Jermall, and 31-0 super welterweight Jermell. The Houston, Texas natives have a strong chance of landing notable fights at the pinnacle their respective divisions, provided they get past their respective competition this coming weekend. Jermell will be facing the 27-2 Tony Harrison for the WBC super welterweight title that he won in 2016 by knocking out John Jackson and has successfully defended three times since. Harrison, who hails from Detroit, will be coming off a split decision win over Ishe Smith last May. This will be Harrison’s second attempt at a world title. Back in 2017, he was knocked out by Jarret Hurd while competing for the IBF super middleweight title in Alabama. Since that time, the fighter has gone on to win three straight. The match with Charlo will be a scheduled twelve round affair. Meanwhile, Jermell’s brother, Jermall, will be facing off against the 28-1 Matvey Korobov for the interim WBC middleweight title strap. Stepping into the ring at Barclay’s for his third fight in a row, Jermall recently bested Hugo Centeno Jr by knockout last April. Korobov, on the other hand, is coming off a March unanimous decision victory over Jonathan Batista in Miami. This will be Korobov’s second bout this year after taking all of 2017 off. Korobov’s one loss was to Ireland’s Andy Lee, who knocked the Russian out in December of that year in Las Vegas. Korobov will be facing quite the challenge in Jermall, who has stopped his last three opponents within the distance. Jermall was originally set to face Willie Monroe Jr on Saturday, but the Monroe, who is best known for getting stopped by Gennady Golovkin in 2015, showed traces of a prohibited substance in a VADA drug test and the fight was subsequently called off. Fortunately for all parties involved, Korobov was able to step in and fill the void left by Monroe. Should he somehow emerge victorious in the scheduled 12 round affair with Jermall, Korobov will have most likely pulled off the upset of the year. 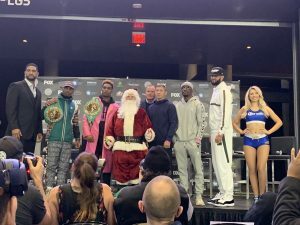 From brand inception through present day, the brass at Premier Boxing Champions (PBC) have looked past mounting criticism of its product with its eyes on the bigger picture. Its parternship with Fox Sports has already begun to show why patience remains a virtue. The rebranding of the PBC on Fox primetime boxing series—which was formally announced during a glossy press conference on November 13—is due to launch with a December 22 tripleheader live from Barclays Center in Brooklyn, New York. The event will kick off a lucrative multi-year agreement between PBC and Fox Sports, with live shows due to run monthly in primetime on Fox and FS1. 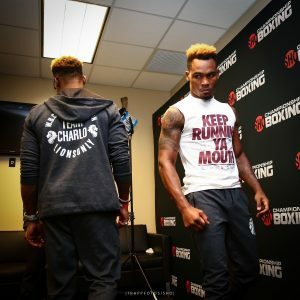 The first show under the new agreement is headlined by the Charlo twins—Jermall and Jermell—in separate title bouts, marking the first time either Charlo serves in the main event of a primetime boxing telecast after years of frequently playing in supporting capacity on cable giant Showtime. Jermall (27-0, 21KOs) defends his interim middleweight title versus Willie Monore, Jr. (23-3, 6KOs) in the main event, while Jermell (31-0, 15KOs) defends his 154-pound strap versus Tony Harrison (27-2, 21KOs) in the co-feature. Both bouts served as the first offerings of Fox’s ‘PBC Countdown’ series, airing this past Saturday immediately following the network’s live coverage of Major League Soccer (MLS) Cup series. ‘PBC Countdown: Jermall Charlo vs. Willie Monroe Jr.’ drew a favorable 1.0 overnight rating (roughly 1.2 million viewers; final figures to come Tuesday morning) for its 11:00pm timeslot, doing well on an active sports night to hold the majority of the audience from MLS Cup, which at 1.35 million viewers drew its best televised audience since 1998. The 11:30pm-slotted ‘PBC Countdown: Jermell Charlo vs. Tony Harrison’ special pulled a 0.6 overnight rating. The launching of ‘PBC Countdown’ comes on the heels of network promos for the December 22 telecast having frequently run during every edition of NFL (National Football League) on Fox since the initial November 13 network presser. The latest batch came in Sunday’s Game of the Week offering, where the Dallas Cowboys beat the Philadelphia Eagles in an overtime thriller which produced a 16.0 overnight rating, the best for any NFL afternoon game this season. Promos for the Charlos’ bouts were also part of network coverage which drew more than 50 million viewers for pro and college football a week ago, as well as back-to-back Thursday Night Football telecasts on Fox—both featuring the Cowboys in games watched by more than 53 million combined viewers. Network promos will continue to run throughout this Thursday’s edition of NFL on Fox, pitting the 11-2 Kansas City Chiefs versus the 10-3 Los Angeles Chargers in a game with major playoff implications at stake. The Charlos will garner more exclusive coverage this Saturday afternoon, starring in the network’s debut of ‘PBC Face-To-Face’ series hosted by award-winning sports writer Mike Coppinger. Similar coverage will come with every edition of PBC on Fox. The next primetime edition will air January 26—also live from Brooklyn, New York—followed by shows on February 14 and March 9 leading into the debut of “PBC on Fox Pay-Per-View”, headlined by Errol Spence Jr. in a welterweight title defense versus Mikey Garcia, who moves up from lightweight in a battle of unbeaten pound-for-pound entrants. Spence and Garcia have both benefitted from NFL exposure, each making separate appearances at Cowboys Stadium for November 22 and November 29 games which aired live on Fox. The November 22 Thanksgiving edition drew 30.8 million viewers, while the November 29 showing—in which the Cowboys upset the NFL-best New Orleans Saints—drew more than 21 million viewers, the best-ever showing for any NFL Thursday Night Football installment (excluding Thanksgiving games) since the primetime series debuted five years ago. “Our boxers have made in game appearances on NFL broadcasts that have been viewed by tens of millions of people,” Smith points out. “[T]he Charlos, who fight on December 22 have been the beneficiaries of the first Countdown show and teases of their upcoming fights during each NFL game on FOX since the fight was announced. 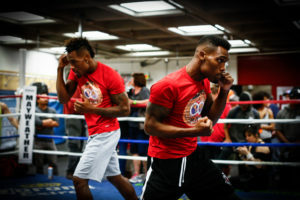 The biggest complaint among the cult following for twin brothers Jermall and Jermell Charlo is that they’ve yet to headline a Premier Boxing Champions (PBC) telecast in primetime. While that problem will be resolved for at least one of the two in their next ring appearance, the next batch of complaints will come in their respective opponents. The unbeaten twins will defend their separate alphabet titles on a December 22 edition of PBC on Fox, live from Barclays Center in Brooklyn, New York. Jermall Charlo will make the first defense of his interim middleweight strap as he faces Willie Monroe Jr. Meanwhile, Jermell Charlo attempts the fourth defense of his 154-pound belt versus Tony Harrison. A coin toss will determine which Charlo gets to headline the primetime doubleheader, which will kick off the rebranded model of PBC’s renewed three-year deal with Fox. The show had promised to make a big splash given the renewed deal, but—beyond the prospect of seeing both Charlos on the same card (and one in the main event)—neither bout really moves the needle. Even though he only holds an interim version of the World Boxing Council (WBC) title, Jermall (27-0, 21KOs) remains in a favorable position given all of the recent movement in the middleweight division. The 28-year old from Houston, Texas moved up from super welterweight (154 lbs. ), where he’d held a title for nearly two years prior to vacating ahead of his July ’17 stoppage win over a hobbled Jorge Heiland. The win—which took place at Barclays Center, where he will now make his third straight appearance—was supposed to guarantee Charlo a crack at the winner between Gennady Golovkin and Saul ‘Canelo’ Alvarez in their Sept. ’17 clash. However, the bout ended in a controversial draw, leading to what was supposed to be an immediate rematch. Charlo wound up fighting for and winning an interim title in a stoppage victory over Hugo Centeno this past April. By that point, the Alvarez-Golovkin rematch had already been postponed until September, with Alvarez taking a decision win. At its annual convention in early October, the WBC granted Alvarez an optional fight while ordering Charlo-Golovkin in a bout to determine the next mandatory challenger to the full title. Obviously that fight won’t materialize next, if ever at all. Golovkin—beltless for the first time since 2010—is currently fielding offers both in the ring and the platform which will broadcast his next fight. It’s obvious a December showdown with Charlo was a non-starter on his end, leaving PBC brass to keep its client busy. A title defense versus Monroe Jr. provides that very opportunity, though is a bit of a letdown given how much attention has been afforded the division just in recent weeks. Monroe Jr. (28-3, 6KOs) figured to surface in a significant event under PBC, which has housed his last two bouts. The veteran contender from upstate New York—who will turn 32 just ahead of fight night—is coming off of a 10-round decision over Javier Maciel in August, his second straight win following a 12-round loss to then-unbeaten titlist Billy Joe Saunders last September. The bout—which was painfully tough to watch—marked his second failed attempt at a middleweight crown. He parlayed his ESPN2 Boxcino Middleweight Tournament crowning into a lucrative May ’15 crack at Gennady Golovkin, suffering three knockdowns en route to a 6th round stoppage defeat live on HBO. Surrounding the title fights are respectable wins over Brandon Adams (in the aforementioned Boxcino finals), Brian Vera and Gabriel Rosado. Jermell Charlo (31-0, 15KOs) has emerged as a cult favorite over the course of his title run. The 28-year old had to rally from way behind in stopping John Jackson to win his portion of the 154-pound crown in May ’16, the win going in the history books as he and Jermall became the first twins in boxing history to simultaneously hold major titles in the same weight division. Whereas Jermall has moved up the scale, Jermell has punched his way to the top of the division. Highlight-reel knockout wins over Charles Hatley and previously unbeaten Erickson Lubin both made their way to several 2017 year-end awards lists, the latter marking his 5th consecutive stoppage win. A close-but-clear points win over former titlist Austin Trout this past June ended that streak, but put Jermell alongside Jarret Hurd—whom outpointed Erislandy Lara in their unification bout on that same card—as the best 154-pound boxers in the world. PBC brass along with the fine folks at Showtime—the industry-leading premium cable outlet who has invested heavily in the 154-pound division—have not at all been shy about the prospect of Charlo and Hurd colliding in a bout to determine the super welterweight king. However, both sides have steadily acknowledged that such a fight wasn’t likely until 2019 as Hurd is rebounding from rotator cuff surgery. Much like his twin, Jermell was forced to realize that seeking bigger game would have to give way—for now—to remaining active. Enter Harrison (27-2, 21KOs), once high among the most lauded prospects under the PBC umbrella. The Detroit-bred middleweight has since fallen to middle-of-the-pack contender, suffering knockout losses to Willie Nelson and Hurd on the undercard of high-profile events. The defeat to Nelson—in which he was winning every round before falling apart late—came in the chief support to PBC’s first primetime card on ESPN in July ’15. A modest three-fight win streak followed, leading to his first career title fight. A Feb. ’17 clash with Hurd aired live on Fox in primetime, as the co-feature to Deontay Wilder’s heavyweight title-defending stoppage win over Gerald Washington. Harrison was competitive until he wasn’t, with Hurd coming on strong late in scoring a 9th round stoppage to claim the vacant title. Harrison has rebounded with a pair of wins including narrowly outpointing Ishe Smith this past May on Bounce TV. His forthcoming showdown with Charlo will mark his second crack at a major title. Meanwhile, one of the Charlos will get the honor of headlining their first PBC primetime event. Both have topped the bill in lesser advertised cards, Jermell on a Halloween ’15 edition of PBC on NBC Sports and Jermall in his first defense of his 154-pound title on a Nov. ’15 afternoon installment of PBC on NBC. They’ve since fought a combined eight times, all of which have aired live on Showtime-televised undercards. Included among the lot was the last time they appeared on the same show—in May ’16, a card that was topped by Lara’s 12-round win over Vanes Martirosyan. Now, their only competition for top billing on the marquee is each other. Sadly, the forthcoming coin-toss to determine such status is perhaps more enticing to boxing fans than either matchup on the announced show. *The main event featuring Victor Ortiz has been cancelled as of 9/27/18. Joe ‘Juggernaut’ Joyce touches down on US soil at the weekend as he looks to continue his rocketing rise up the rankings against Iago Kiladze over eight rounds. 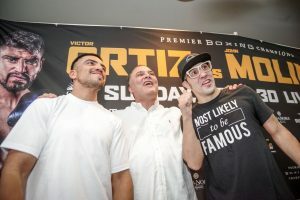 The card itself is headlined by a 12 round welterweight contest between Victor Ortiz and John Molina Jr with the pair, who’s combined ages hit 66, looking for one final crack at the jackpot. Truth be told, both gentleman look as though their best days are behind them but you suspect Ortiz will come into it the more confident with the ever brash 31 year old having held talks to fight Brandon Rios earlier in the year – Ortiz admits that he will be throwing fire from the very off, those are his intentions anyway, and the 12 rounds he shared with Devon Alexander, whilst not of any particularly notable quality, will stand him in good stead. Molina is in his second contest since a brutal, one-sided demolition loss to Terence Crawford – a fight that saw him knocked out in the eighth round – and that initial comeback fight, against Ivan Redkach, was far from impressive. A reckless fight, Molina was dropped before sending his counterpart to the canvas twice to claim a fourth round stoppage but that was a result that flattered to deceive. These two know that, with all due respect, they are fairly inconsequential names in the welterweight division as it stands with no major draw for those at the top, if they are to get back into the mix where they are even being TALKED about in the same sentence as Amir Khan, Manny Pacuqiao and so on then they need to pull it out of the bag and send a statement come Sunday night. Joe Joyce will be in his sixth paid contest and goes up against the ‘Georgian Grizzly Bear’ in Iago Kiladze. Once hailed as a prospect to watch in the cruiserweight division – some eight years back – Kiladze returned to the ring in 2017 as a heavyweight, following a two year absence, and since then has racked up wins against Byron Polley and Pedro Rodriguez before becoming the prey against Adam Kownacki and Michael Hunter. Both those defeats came this year – January and June, respectively – and the odds are stacked firmly against him this time around. He’ll give it a go, though, he always does but this fight is more about getting Joyce the American exposure that Ringstar crave so desperately. In a career filled with late replacements and disappointing opponents, this is the 2nd best foe that Joyce has looked to slay thus far and with a combined 13 rounds under his belt – an average 2.6 per contest – it wouldn’t do him harm to get some rounds under his belt. Bring on that Putney-Mexican hybrid style of dancing after the fight because Joyce looks certain to win unless Kiladze can produce a colossal upset. Also in the heavyweight division is Efe Ajagba who will be hoping to get more of a challenge than he did last time out – Curtis Harper, that’s all that needs to be said – and he shares the ring with, also unbeaten, Nick Jones over the course of scheduled six rounds. Brandon The Heartbreaker Figueroa will look to continue his impressive development by adding Oscar Escandon to a CV already 16 names long – his last three fights have seen him emerge victorious thanks to a knockout and it seems that, as the 21 year old goes through the motions, he’s really growing into his man power and that’s not meant in a disrespectful way but his body is still filling out and if you look at the 3, 4lbs that he’s put – on the scales – over the past couple years then you start to understand where that extra power is coming from. Escandon, vastly experienced, is looking to cause an upset and resurrect his career which is currently on a drastically downward spiral having lost three of his last four and the last two back to back – against Gary Russel Jr and Tugstsogt Nyambayar. Neither are opponents to sniff at, by no means, but you get the impression that Escandon is becoming a bit of a gatekeeper for these up and coming prospects to get a name on their resumé. Two ageing sluggers, a James DeGale hoping to look as good as he did four years ago, 11 unbeaten prospects – Figueroa, Joyce, Davies, Ajagba, to name four – and a debutant. Sunday night on FOX Sports 1 delivers it all and it is set to be a stonker. 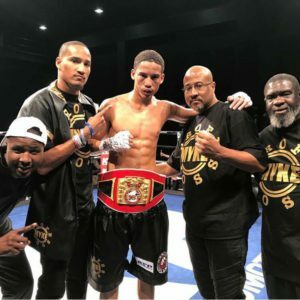 In covering a Marshall Kauffman King’s Promotions show Friday night at the Bethlehem Sands Event Center I met Mykal Fox and unbeaten 6:03½ Super Lightweight with a 16-0 (4), record who will be the Main Event May 11th at the SugarHouse Casino in Philadelphia. King’s Promotions will promote this while in another part of Philadelphia the Boxing Director Greg Sirb did it again! Greg Cohen Promotions and Hard Hitting Promotions will be at the 2300 Arena in South Philly via Showtime with David Haney against Mason Menard in the Main Event. Sirb approved of two shows December 1st at the same two facilities. That was a “writer’s nightmare” because you get one of the promoters upset if you don’t go to their show. Getting back to Fox he told me “I was 40-60 in the amateurs”. I asked if he meant 40-6? He repeated 40-60. “I wasn’t that dedicated,” he said. No kidding! But, what a turn around. He has another brother that also boxes. “My dad Troy is my trainer. My brother Alantez (“Sly Aza, 23-1-1 (11), middleweight). Reggie Brown is my cut man,” said Fox. I knew about his brother who has had a good career so far. He lost for the first time in his last fight to Demitrius Andrade, 24-0, in November of 2017, but had him down in the 7th round. “My brother always was my biggest supporter and my best training partner. We push each other regularly,” said Fox. His brother is 26 while the younger brother is 22. Mykal turned pro in April of 2014 while his older brother turned pro July of 2010. It wasn’t until July 18th in 2015 that they fought on the same show with his brother scoring a 1st round KO and Mykal winning a 6 round decision. It’s been the only time on the same card. I asked him about some of his tougher opponents. “Claudinei Lucerda, 16-13-1, who actually fought at 154 and dropped to 140 but his punching power came with him. In the first round he hit me with some hard body shots. Tre’Sean Wiggins, 7-2, was another power puncher but he also had very quick hands. Alejandro Reyes, 11-3-1, was another. I went up a weight class to face him. He was an aggressive action fighter true to Mexican style. Ricardo Garcia, 14-1, was an awkward fighter and I know I lost the first two rounds against him,” said Fox. In Fox’s first three years he fought a total of four fights each year. In 2017 he only had three fights. He has one fight this year and the other on May 11th scheduled. Kauffman will keep him busy. On his November 21st fight he won the vacant Universal Boxing Federation (UBF) All America Welterweight title though only weighing 143 which has been his highest weight so far when he defeated Manuel Alejandro Reyes. Fox will have a tough opponent in his May bout in Anthony Mercado, 11-3 (10), from Arecibo, PR. He won his first 7 fight by KO and followed with three more wins. Then dropped two bouts before winning his most recent one in March when his opponent Tyrone Crawly, Jr., 7-0, hurt his hand and couldn’t come out after 3 rounds. Fox’s first 10 fights were in Ft. Washington or Washington, MD. On June 28th of 2016 he finally fought out of MD at the Sands Bethlehem Event Center winning all six rounds over Jose M. Valderrama, 5-13. He returned to this facility in November defeated Reyes over 10 rounds and in February defeating Garcia over 8 rounds. In Fox’s debut he defeated David Ruiz who was also in his debut. In his 5th fight he was in his first 6 rounder defeating Luis Rodriguez, 3-1. He has also defeated Juan Carlos Castillo, 4-2, Adam Mate, 18-6, Sommer Martin, 5-2, Juan Rodriguez, 6-5-1, and Daniel Sostre, 13-12-1, among those opponents with winning records. It looks like the younger Fox has a bright future though not a real good puncher. But, with that height advantage he should be able to out box his opponents. Mercado will be a good test on May 11th at the SugarHouse Casino in Philadelphia. PBC on Fox Results: Alexander and Ortiz fight to a Draw. Tonight, on PBC on Fox, the talented but enigmatic Victor Ortiz (32-6-2, 25 KOs) took on former world champion Devon Alexander (27-4, 14 KOs) in a twelve-round welterweight clash. No belt was on the line, but both fighters knew what was at stake: the winner would have a meaningful claim in the deep welterweight division, while the loser very well might mark the end of his career. In a close, professional first round, both men boxed from range, and Alexander just nipped the round, landing one clean shot. Ortiz was looking to land a lead hook in the second round, feinting his way in. Alexander’s hand speed was noticeable, however, and Ortiz suffered a cut on his forehead. It was another extremely close round. Alexander looked the better fighter in the third round, showing world-class accuracy and speed. In the fourth, Alexander continued to land precise shots, with Ortiz’s left eye noticeably swelling. The pattern continued in the middle rounds, with Ortiz trying to feint his way in, but Alexander timing him with precise, short shots. Ortiz did get inside at the end of the fifth, but could not do any significant damage. In the seventh, Ortiz bulled his way in, and there was a lot of leather exchanged at close range. The eighth was an exciting round, two professionals exhibiting a high level of skill and courage. It might have been Ortiz’s best round, but Alexander seemed none daunted. The ninth was full of action, but Alexander’s footwork allowed him to dictate the range (most of the time), and thus Ortiz could not make it an inside brawl. In the eleventh, Ortiz was looking to land some wide hooks, while Alexander remained sharp and accurate. In the final frame, Ortiz fought with urgency but he seemed unable to summon enough energy after a tough and exhausting effort. For a fighter who has taken a lot of criticism regarding his heart, Ortiz fought like a lion. The scorecards came a stunner. Inexplicably, a majority draw with two cards 114-114, and one card 115-113 for Ortiz. In the co-feature, undefeated prospect Caleb “Sweet Hands” Plant (16-0, 10 KOs) took on rugged and experienced Rogelio “Porky” Medina (38-8, 32 KOs) in a twelve-round world title eliminator at 168 pounds. Sold as America vs. Mexico, the storyline was more interesting as undefeated prospect against tested and tough veteran. Medina failed to make weight, however, and appeared in the ring with a brace on his left knee. Plant showed a strong left jab in the first round, taking no risks. In the second, Plant dropped his left hand, and allowed Medina to come forward and dictate the action. Plant spent a significant portion of the round back-peddling, earning a Bronx cheer from the crowd. But in the third round, Plant appeared looser and more confident, bouncing on the balls of his feet and landing some clean counters. Medina had no answers and began to take real punishment. Medina had some success in the fourth, but Plant landed more jabs and used his footwork to frustrate the Mexican veteran. In the middle rounds, Medina could not negate Plant’s advantage in reach and Plant’s jab. Plant was winning rounds jabbing and countering, but he never seemed like he wanted to get Medina out of there. In the late rounds, Plant remained in control, always boxing, always safe. Medina showed a ton of heart and desire, but could not make inroads against Plant’s defensive footwork. Going twelve rounds for the first time in his career, Caleb Plant earned the decision 120-108, 119-109, 117-111, running his record to a perfect 17-0. In earlier action, US Olympian Carlos Balderas (3-0, 3 KOs) showcased his elite-level skills, outpointing Jorge Rojas (4-2-1, 2 KOs) in a four-round lightweight bout. Prior to the televised bouts, Detroit’s Tony Harrison (25-2, 20 KOs) stopped George Sosa (15-12, 15 KOs) in the fifth round, for Harrison’s second win since losing to Jarrett “Swift” Hurd in February of 2017.